Happy Handmade Monday! I’ve got a fun and informative tutorial for you today sharing how to make silk-screened tee-shirts with the YuDu Screen Printing System. Of course you should have a YuDu before this tutorial will be of any help, but even if you don’t and you have an awesome tee-shirt design idea, you can enter my “I’ll make your tee-shirt!” Contest and have a chance at winning a couple of tee-shirts with your design screen printed on it! More details on the contest are listed at the end of this tutorial. In today’s Handmade Monday tutorial, I am going to go over the steps to create a screen and show how to screen a shirt with a YuDu. The YuDu website has great line-drawn instructions, but of course, seeing it in “real life” is always helpful, too! Step one when getting ready to make a screen for the YuDu is to first select a design to put on the screen (and then tee-shirt). Once the image is selected, it will be copied to a transparency. 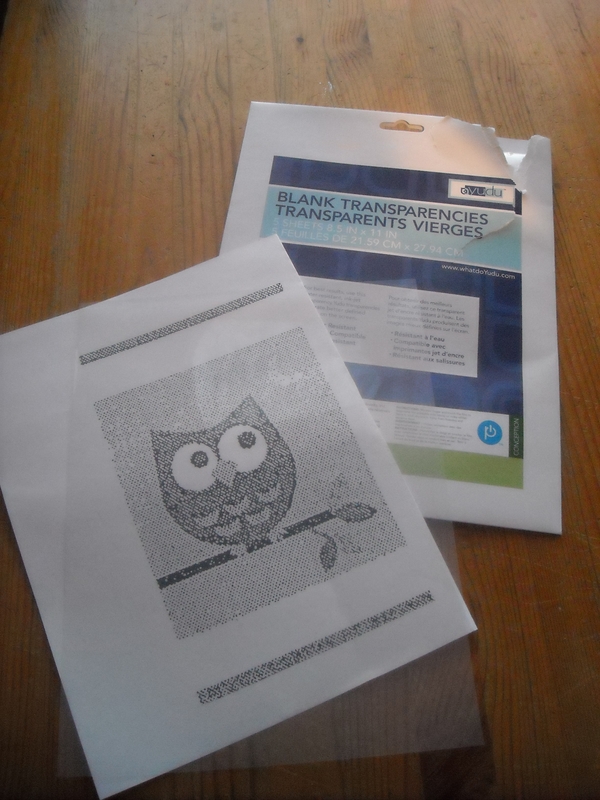 The image can be copied to the transparency in a couple of ways. YuDu sells ink jet printer-friendly transparencies, so you could print an image off of the computer onto the transparency, or you can simply free hand draw or trace an image with a Sharpie marker. Image is copied to the transparency. Once your image is ready to go on the transparency, the next step is to prep your screen by adhering the emulsion to the screen. The emulsion is what you will “burn” your image into later. A clean screen, emulsion sheet, and water bottle are needed for the next step. On a side note, you might see the faint outline of letters on the screen in this picture above. The reason for this is because the screen I am using in this picture has been used before. Once the emulsion is applied these faint letters will not remain visible. This quality is one great thing about YuDu screens- they are reusable. When starting with the screen in this step, whether it is new or used, make sure the screen is very clean with no oils or fuzz or anything like that on it. Be sure to do the following steps in a dimly lit room to avoid exposing the emulsion to too much light. I’ll apologize in advance for the next couple of dark pictures, but I didn’t want to risk ruining an emulsion sheet by exposing it to a camera flash. Now, use the water squirt bottle to soak the screen pretty thoroughly. Once the screen is wet, remove one sheet of emulsion from the protective black plastic wrap. You will put the dull side of the emulsion sheet down onto the back side of the screen (the back side is the flush side-no lip or edge). Center the sheet in the middle of the screen as best as you can and use a squeegee (on the shiny side of the emulsion sheet)to pull out any air bubbles and ensure good contact between the emulsion and the screen. If you need to add a little more water to ensure all the emulsion is wet against the screen, use the squirt bottle to mist both sides of the screen. 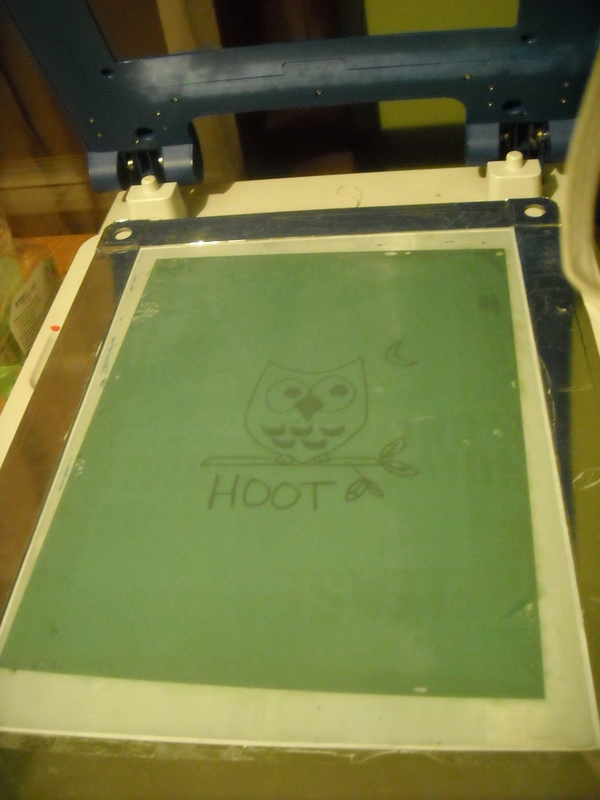 The emulsion sheet is adhered to the screen. 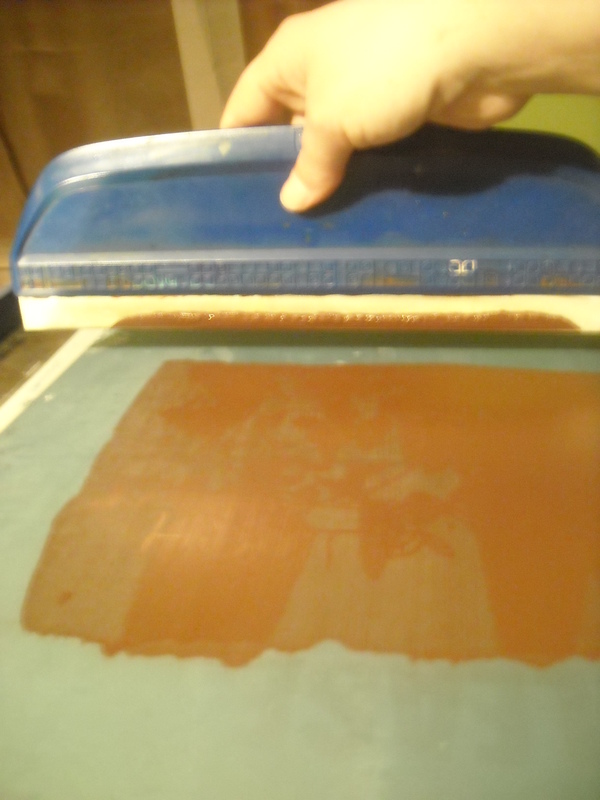 After the emulsion is on the screen, it is time to dry the screen thoroughly. This step may take 20-40 minutes. You can use a towel to dry the edges of the screen, but don’t rub it on the emulsion. The YuDu has a built in fan, so you will slide the screen into the drying area and click the button to turn on the fan. Slide the screen into the bottom rack of the YuDu to dry it. Do not try to rush the drying step. It is very important to allow the screen to dry all the way. Do not try rubbing your fingers on the emulsion to check for dryness, or you may ruin it. Just be patient! 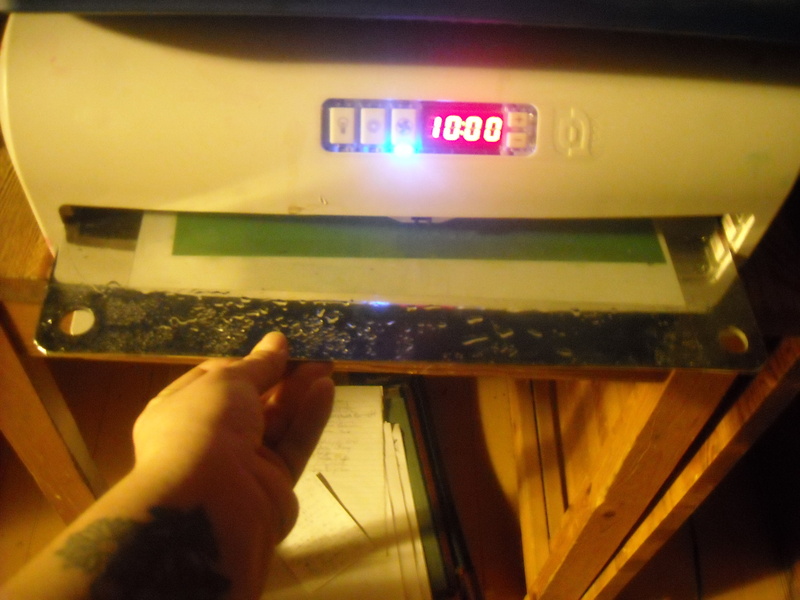 When the emulsion is completely dry, there is a plastic film on the screen that held the emulsion that will need to be peeled off. If applied corrected and allowed to dry thoroughly, the plastic should easily peel off the screen at this point. It is now time to burn the image onto the screen. Using clear tape, center and then secure the transparency to the glass. Using clear tape, secure the transparency to the center of the glass light box, then put the screen down on top of the transparency. Make sure the screen aligns on the 4 corner pegs when placing it on top of the transparency. Align the screen on the four pegs, being sure to put the flush side of the screen (the emulsion side) down on the transparency. Place a platen, foam side down, on top of the screen. Next, put your YuDu platen down on top of the screen foam side down. Be certain you put the foam side down. If you put the sticky side down then you will ruin the screen. Add about 5 pounds of weight on top of the platen. 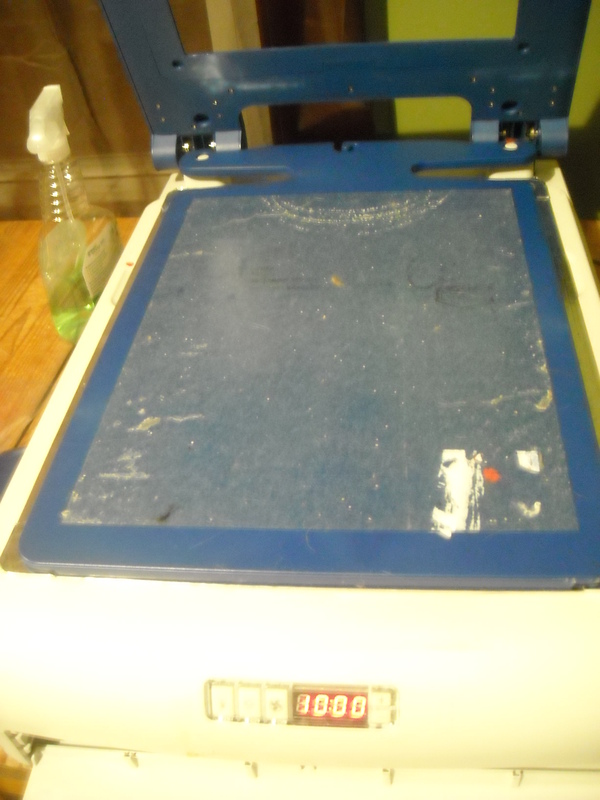 Pull down the blue frame and then put about five pounds of weight on top of the platen. You can use a brick or whatever you have handy. 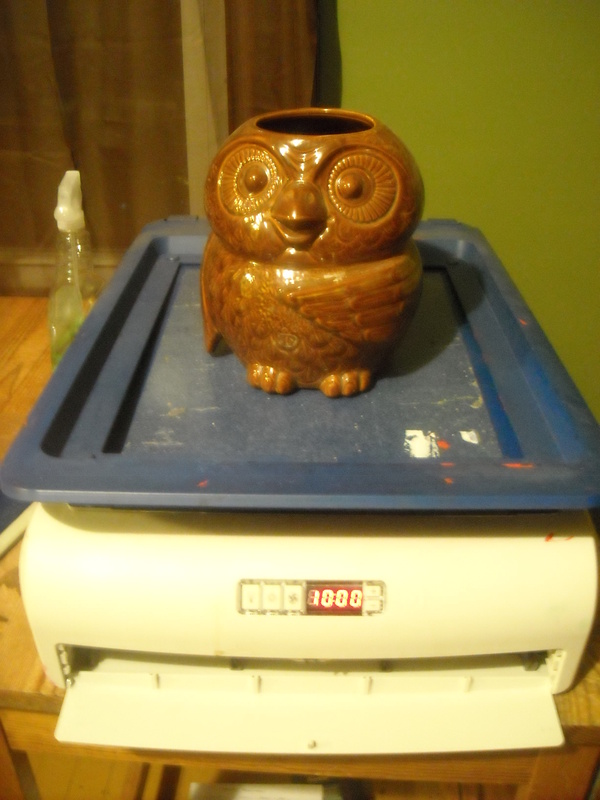 I just happened to have this vintage owl planter handy, so that is what I used. After you have applied the weight, set the timer on the front of the YuDu to 8 minutes, and turn on the exposure light (press the sun burst button). This is the best part of the process, because when the light goes off, you will see your screen is almost done! When the screen has been exposed, the emulsion will turn blue. 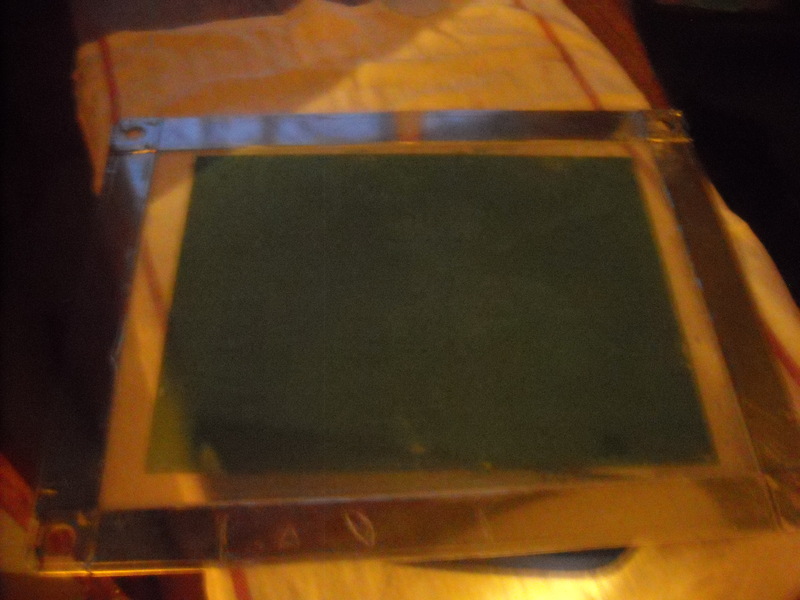 Once the screen has been exposed, the emulsion will turn blue and you will see that your image is a green outline on the blue emulsion (sorry, I forgot to take a picture on this step). You can use a sink or your squirt bottle to wet the screen again. Wait for about a minute, and then the green lines will start to dissolve, leaving clean white lines. You may need to use a towel or sponge to help remove the green parts and reveal the white lines. After all the green lines are gone and your image is all white (like the picture above) it is time to dry the screen again. You can use a towel this time to remove most of the moisture, then slide the screen back into the YuDu, turn on the fan, and let it dry for about 20 minutes. Again, make sure it is totally dry before moving onto the next step. I forgot to take pictures of the next two steps, but after the screen is dry you will want to run clear tape around the outside edges of the screen. Where ever there is not blue, ink will go through the screen, so tape off the edges to avoid getting ink where you don’t want it. 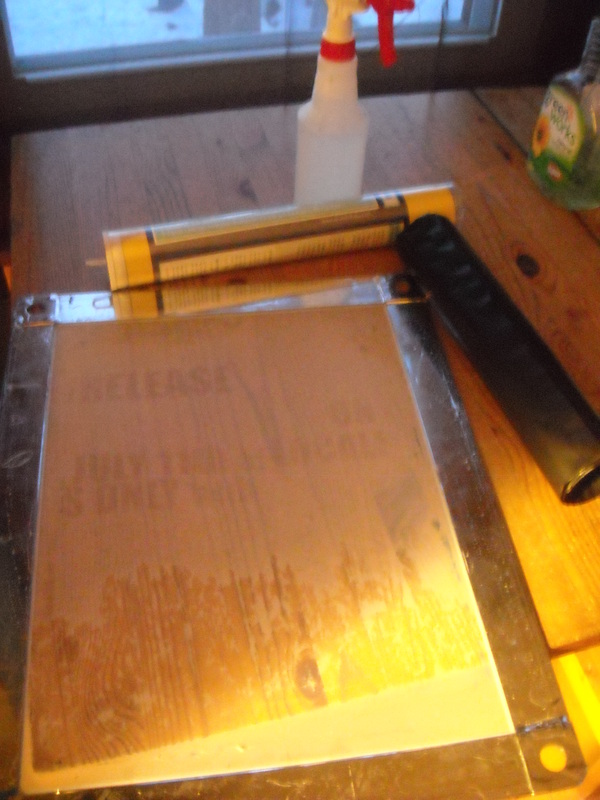 You will then put a tee-shirt on a platen and lift up the blue frame and place the platen on the platen posts. Smooth out the shirt if necessary. Pull the frame about halfway down and place the screen on the blue frame on the posts to hold it into place and, here’s the exciting part, put some Yudu ink on the screen and prepare to make your first shirt! Apply a thick line of ink above the image. 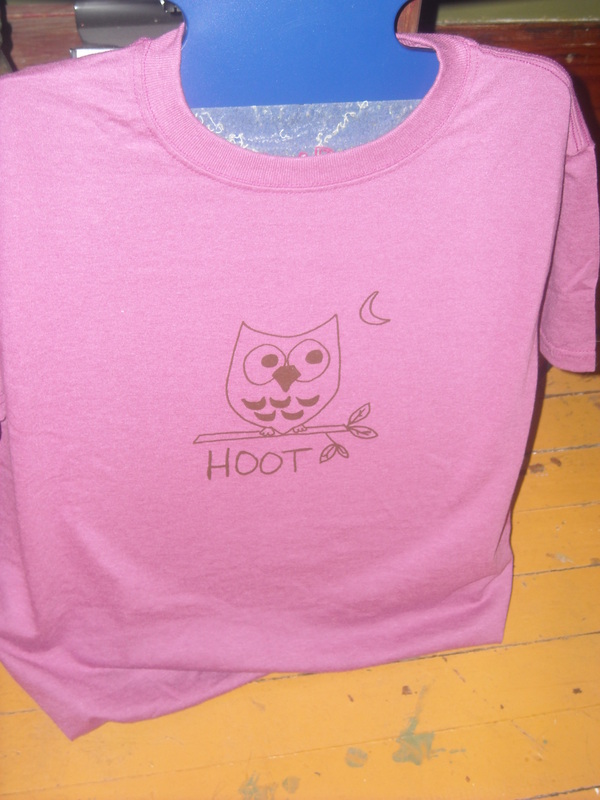 I decided to use a brown ink for this shirt, but there are tons of colors of YuDu ink to choose from. The YuDu ink is very nice because it is water soluble before it dries, so it will wash off your fingers and the screen and squeegee easily when you are ready. Make sure the first pull of ink fully fills in all the white lines of the image on your screen. 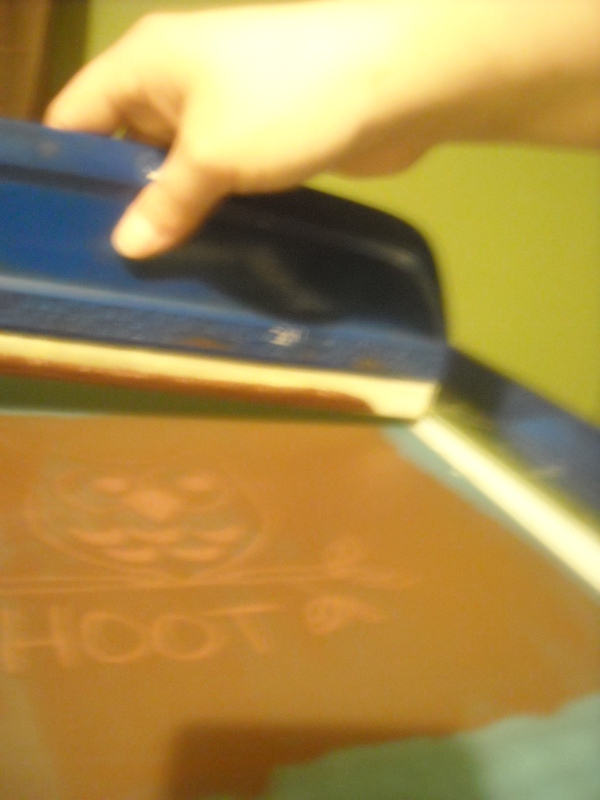 Using a squeegee, pull the ink down toward you to cover the image. Make sure you haven’t pulled the frame all the way down yet- the first time you pull the ink you do not want it on the shirt. The ink should fully fill in all the white lines on the screen. When the screen is against the shirt, you can see the ink transfer from the screen to your shirt on this second pull. Now, pull the frame all the way down onto the shirt and smoothly and evenly, and in one motion, pull your squeegee across the screen toward you. This pull will transfer the ink from the screen onto your tee-shirt. You will be able to see this happen because the ink on the white lines will leave the screen as you pull the squeegee across the After this pull, lift the screen frame back up off of the shirt. You have now successfully screened your first shirt! The screened image will have clean, crisp lines. 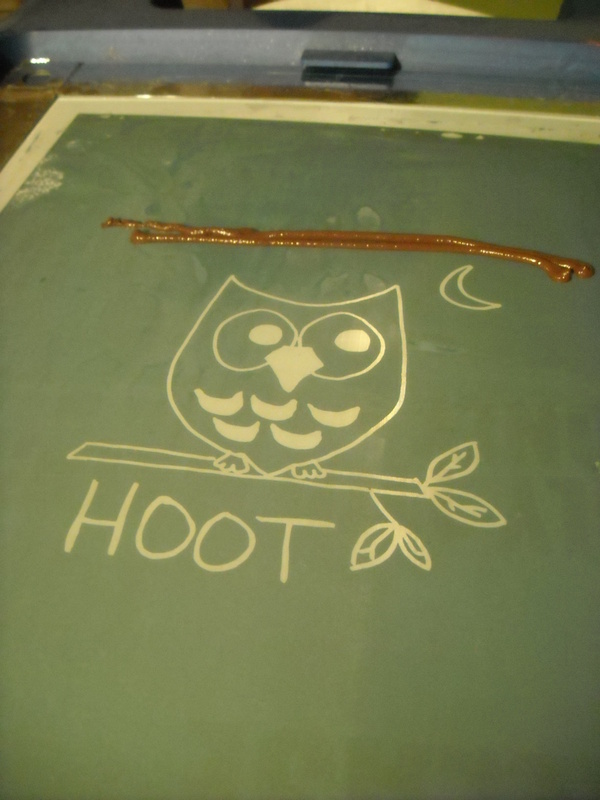 Allow the shirt to dry on the platen for a few minutes before removing. How exciting! Now you have made your first shirt and you can make as many more shirts with the same design as you want! To make your next shirt, remove the shirt on the platen off of the YuDu machine and add another shirt on another platen, add ink and make your first pull with the screen off the shirt, then bring the screen down and pull again to transfer the image to the shirt. 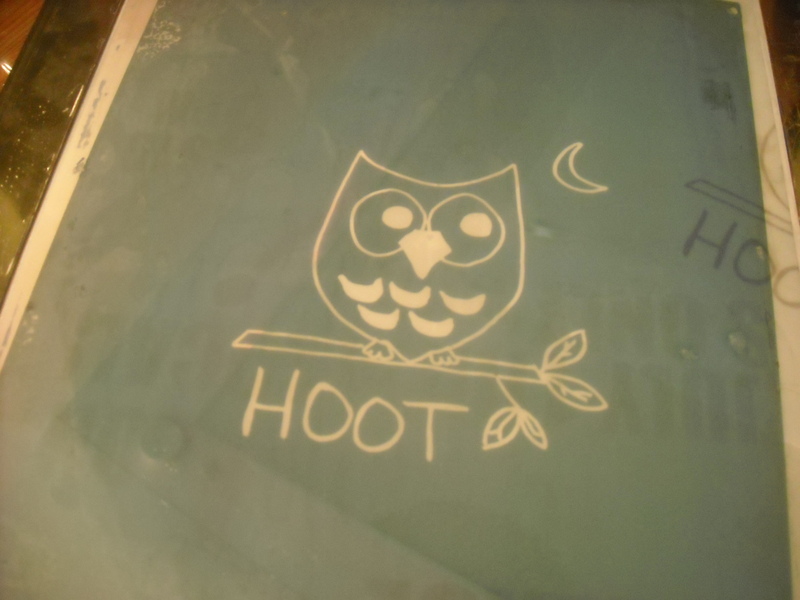 If you only have one platen, you will want to wait about five minutes to let the ink start to dry before trying to remove the shirt to use the platen again. You can also use a blow dryer to speed up the drying process. If you want to change colors of ink, you’ll have to wash the ink off in the sink (this is ok because YuDu ink is biodegradable!) and allow the screen to dry completely before adding a new color. 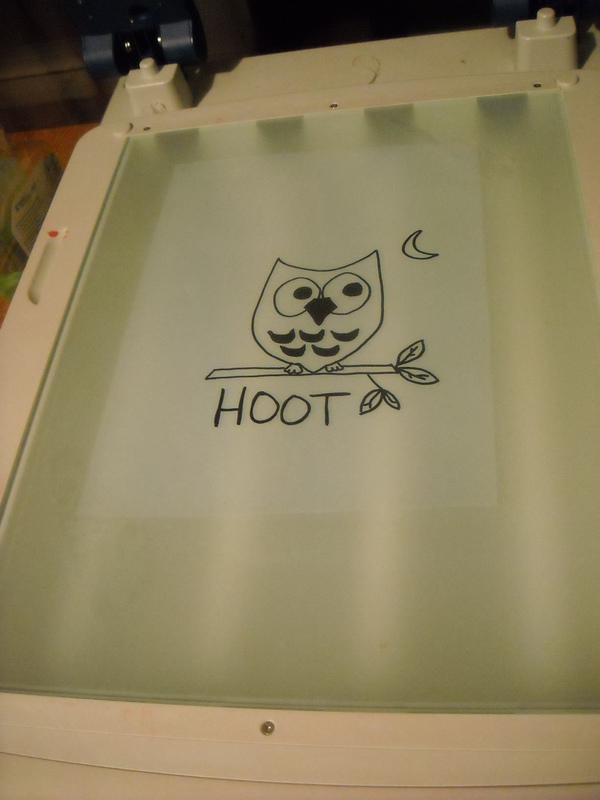 If you do not let it dry the ink will run, so be sure to always use a dry screen! The final step is to allow the ink to dry and then to iron the image with the cotton setting on your iron for about one minute. Just move the iron back and forth slowly. The heat from the iron will set the ink into your shirt. If you fail to do this step, the ink on your shirt can run out and ruin the image and shirt. Now you can make as many shirts as you want! Remember when you are finished making shirts that you wash the ink of off your screen so you can use it again later. The screen will last a long time if you take care of it. When you are done with the image, you can use YuDu emulsion remover to clean off all the blue emulsion and start over again with a new image! The YuDu is such a fantastic all-in-one system that I know you will enjoy it if you get one for yourself! 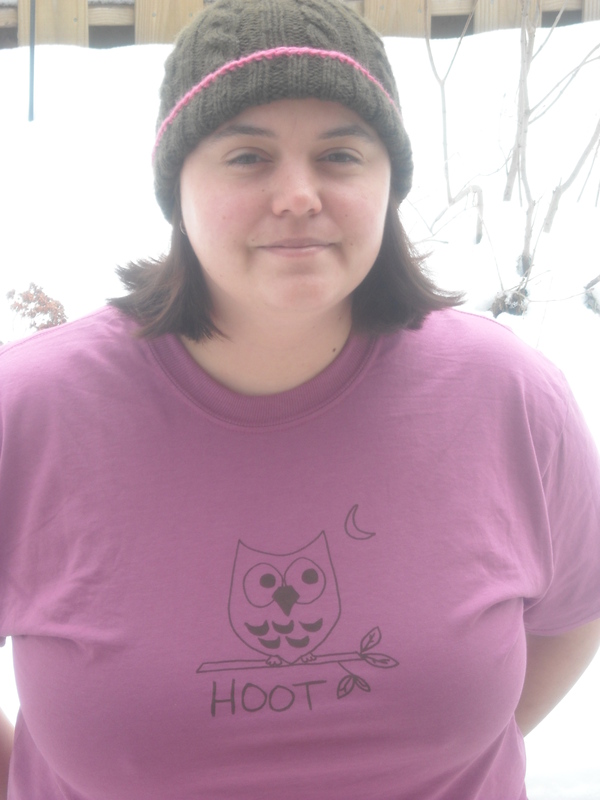 Here I am enjoying my new shirt! Wouldn’t you like a shirt with your own design on it? Well, lucky for you, I’m launching a “I’ll make your tee-shirt!” Design Contest today! This is the first time I have hosted a contest like this before, but I am very excited to do it. If you have a tee-shirt design floating around in your mind, you can submit for a chance to win 2 tee-shirts in your choice of sizes with your design screen printed on it! Ok, here is how the contest is going to work. Between now and March 21st I am inviting you to submit an image (or several if you want to!) for a chance to win 2 shirts with your image screened on it. There are a few things I’d like to do with the winning image: Make you 2 shirts and make approximately 25 shirts with your image to sell in my Etsy Shop. If you submit an image, you retain the rights to that image, but, by submitting, you are agreeing to allow me to reproduce the image up to 25 times. You will receive full credit for the image in all Etsy listings and I suggest you even include your signature in an appropriate way somewhere on the image. 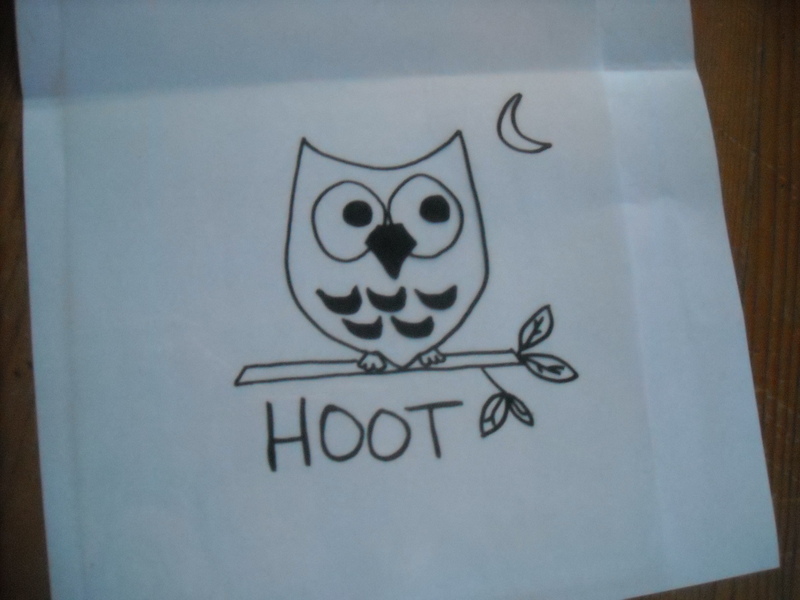 The image should be a line drawing and will only be printed in one color, so please keep that in mind while designing. The image should be no larger than 8 1/2 by 11 (like a regular sheet of paper size). So, how do you enter this contest? It’s pretty simple. All you have to do is design your image and email it to me by March 21st. The winner will be announced by March 24th and then I will make the shirts and mail you your shirts. 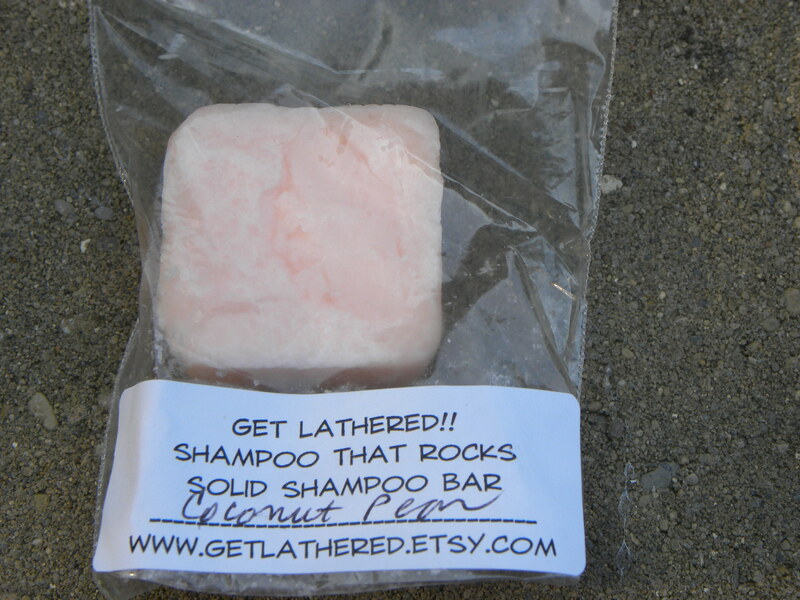 I will also announce your win on the blog and link to your blog or website. To submit your image, email it either as a .pdf or .jpg to me at mellenlatta[at]gmail.com with your contact information . If I select your image I will email you and find out what size shirts you want and even what color shirts and ink you would like! Good luck and I can’t wait to see your image designs! If you have any questions, feel free to leave them in the comments, or email me directly. 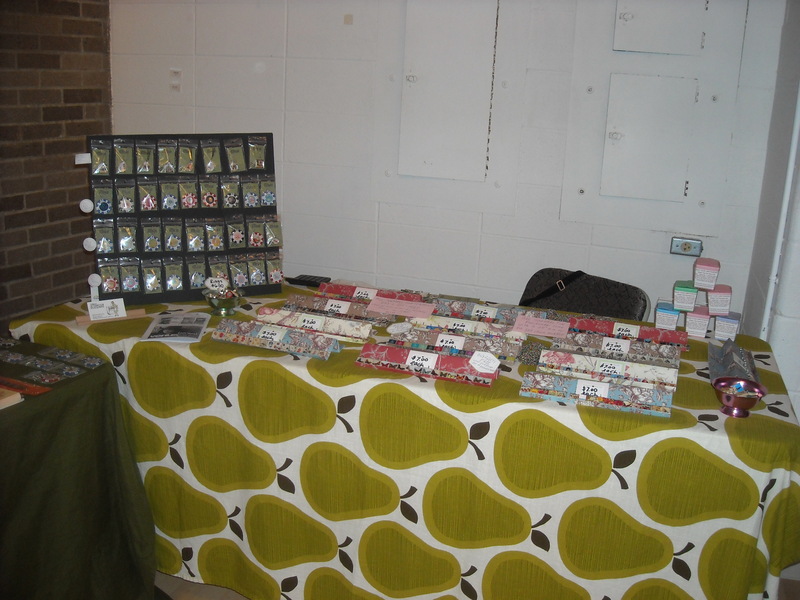 And again, Happy Handmade Monday! 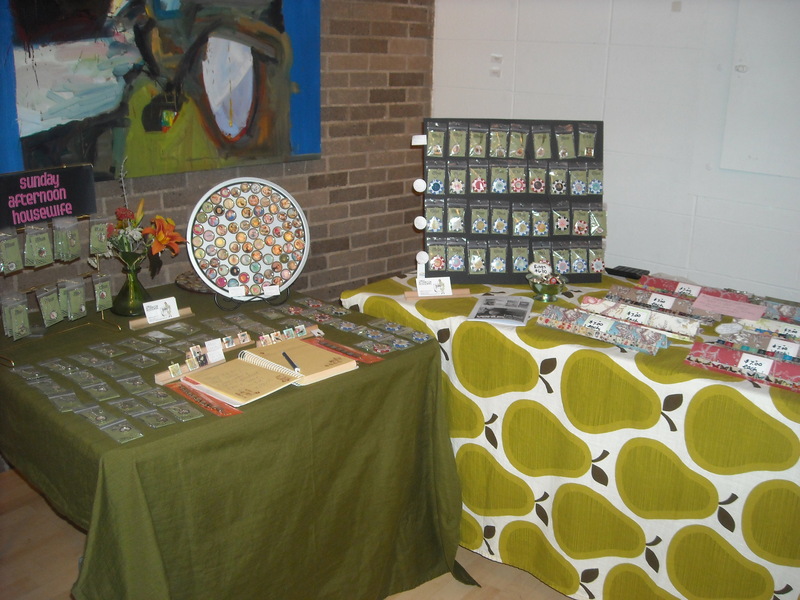 Here’s something quick and fun for your Saturday reading: Kelly at The Coupon Scoop has done a a really nice review of my scrabble tile pendants and is giving 2 away to a couple of lucky people! It will just take a minute, so head on over to her blog and follow her instructions for a chance to win any scrabble tile pendant from my Etsy shop! Good luck! 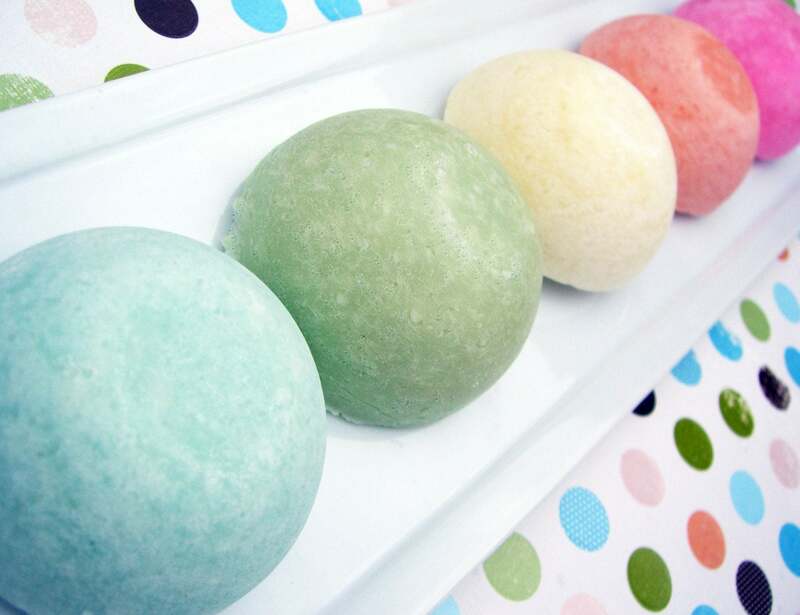 Click right here to go to The Coupon Scoop/Sunday Afternoon Housewife Review and Giveaway!